A good squirting with Quickstart was the first step - the less you have to kick a 495 the better. Twenty kicks later - ten of which kicked back and the thing started. LOUD! The whole paddock stopped what they were doing and looked open mouthed. Not wanting to stay the center of attention I quickly set off to the track. The first impression was that you really had to rev it to get it going which was kind of what I'd expected from riding a CR125 12 years previously. There was plently of power though and the bike charged up to the first corner. I hit the brakes and nothing much happened so I just tipped it in expecting to slide a bit but get away with it. I fell off. Bugger. For the next corner I used engine braking, tipped it in and fell off. The front just kept washing. This is when I figured out that the front brake was binding - loosening it right off and not touching it seemed a good short term solution. The bike pulled with less revs without the front brake on as well.... in fact its got a really strong bottom end. I managed to stay on for a couple of corners then the track got wetter and the rounded off rear tyre became a problem. For the next few corners it was the same story - potter in, gas it up, spin round in a circle and fall off. 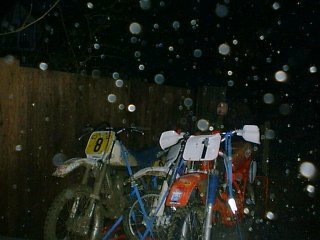 Other obvious problems included a kick start that stuck in my leg while riding, levers that I could never find when I wanted them, a grabby clutch, and bits falling off. I did two laps that first day, fell off at almost every corner. I never did get out of first gear... leading me to suspect it had previously been used for land speed record attempts. Over the next couple of outings I sorted the ergonomics as best I could with new levers, grips and kick start and of course I fitted some brakes. I really can't emphasise enough how important brakes are on a 500 crosser... New tyres were also fitted. It still kicked back though. The next landmark outing proved the bike to be pretty rideable. A dry track, brakes and grip showed that the bike's suspension was good enough and the bike handled. It handled like a combine-harvester but it did handle. The suspension did bottom out over some jumps, but that's down to me being slow and a bit heavy for a motocrosser at 17 stone (240lbs). 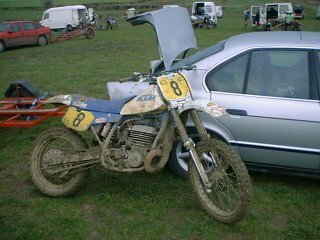 Compared with my brothers CR250 (another old bike - an 85) it had more mid range but less bottom end and neither have a real top end. An incident on the track made me consider altering the timing... in a slow corner I thought I was about to stall it (still geared for land speed records) and grabbed the clutch just in time (thanks to the new levers being somehwere near my fingers). With the engine still running I dumped the clucth and pulled off... backwards. Yes really. Backwards. I thought I must be going mad, pulled the clutch in and tried again. Backwards. Hmm... that kick back problem was obviously timing related. With the timing sorted the bike now revs much further, has strong bottom, mid and top end (the non-binding front brake helps the bottom end as well...) but spins up slowly - there is probably room to improve this but might be something to do with a flywheel the size of a go kart wheel. It's running rich as well. It does oil if you plod it but if you stick to first and second this doesn't happen - yes its still geared ridiculously high. It now goes well enough to run with the guys who ride for fun at the practice track - and blitzing people riding kit worth 10 times my rampaging combine-harvester makes me grin... (even if it is their first bike). Not yet. I've repacked the exhaust as well - I doubt that it'll make it any quieter but at least I've made the effort. Lower gearing is on the To-Do-List as is a bit more fiddling with it timing and getting a ding out of the expansion chamber but its not bad. I still fall off a lot but I can't blame the bike for that. As you can see in the picture bellow it fairly tidy now - you can see the left hand kick start (tiny for a 500) and there's a spare front wheel in the background. Hey Rick, I used to own a 1983 Maico 490 Sandspider. That was by far the fastest bike I have ever owned or ridden. 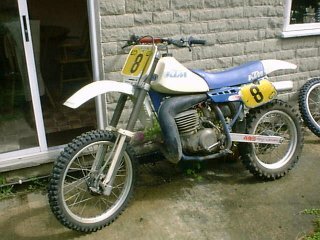 Even now any bike that I ride, I always compare it to "THE MAICO". The only problem that I had was finding parts. JD Mjr You’re right, in that the 490 was a missile. It can still pull a hole-shot against a modern open class bike. 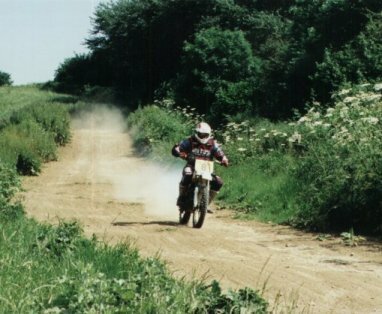 The only bike I’ve ever ridden that was faster –through the gears and top end - was the 495 KTM. It was a real brute to ride, though, and beat you up physically when you rode it hard.